Why do you practice such an authoritarian version of Marx's ideals? Authoritarianism has only led to suffering here in the USSA, where under the reign of Premier Foster, the workers he stood for were forced to work a gunpoint, purges were enacted against rival political factions, and the minds of the youth were coaxed into worshipping him as a divine figure. His actions were so brutal that he started a revolt amongst the Mexicans, a consequence which continues to haunt the United to this day. We had simply replaced one tyrant with another upon letting him lead the revolution in place of the old order. I fear your nation may be making the same mistake. Please refer to this country as the USSA (United Socialist States of America) in IC. "We most certainly don't hold our workers at gunpoint, Comrade President; and neither do we force our working-class to worship our ideology as divinity. The culture of my people is a strictly Oriental one, and I understand if you cannot fully understand it. The people have, themselves, created a system to give thanks to the leaders of our nation to remind themselves of the roles we each have in society, and of the traditions we have fought for so long to protect. The problem with understanding this phenomenon lies in a Soviet reactionary fallacy that there must be separation between State and people. In Asia, this schism has already been overthrown through means of Cultural Revolution. In fact, it is the division between State and People that creates dictators under Socialism; such as Leon Trotsky, or Maduro, in Venezuela. The schism refutes the people from the revolution, giving limelight for the individual to exploit the system for determinism, and for one's own freedom over the freedom of the collective. In Asia, one must be self-governing, but mindful of the needs of the collective. A citizen must be wise enough to know when to conform, and when to oppose. When one must conform, called by the tide of war or by the need to abide by the Igarashi System; one must give oneself wholly to the needs of the collective, and remind oneself of the wisdom of the Great Leaders. But when one is called to give critical thought, he must be swift like a viper, giving no leeway; challenging the system wholeheartedly. But even then, one must contemplate whether that opposition will benefit the collective in the end. It is not ignorance, it is love of one's own; a love that has nothing to do with Democracy or Authoritarianism. It is what empowers our working-class to strive to be the best version of themselves each and every day." Which is your favourite anti-communist song? SOROS PREVAILS wrote: Which is your favourite anti-communist song? "Odd question; but I think that would be 'Mr. Stalin, You're Eating Too High on the Hog'." Why do you hate our nation even thought we are not so different.Both of our cultures have suffered because of the capitalist, you were exploited and abused while we lost everything and had to resort to more brutal methods to survive their betreyal.You may see our methods as fascist, genocidal and insane but i assure you my brother is doing all of that not because he wants to but because he has to.As a sign of goodwill i have been ordered to offer you the Scorpion company as voluenteers in your armed forces to help in your current and hopefully future wars.If you refuse our gift then unfortunately your western enemies will have some new toys to play with and trust me you will not like those toys, but i hope you will accept our offer and be our ally in the future. "I assure you, Mr. Consul, that you and I are very different. Firstly, I don't even think you have fully grasped the ideal of Fascism which you so proudly boast about. You scream you're oppressed by Capitalism, yet the world's most Fascistic Fascist, Mussolini, cooperated with corporal feudalists to build his nation's army; peak elitism. Fascism is not Totalitarian Socialism. Fascism is Totalitarian Capitalism. If it were the former, then why has every Fascist leader in history despised Socialism with so much gusto? Why has Fascism failed on the homefront every time it is implemented? The answer lies in the lack of class struggle. You mock our collectivism by offering us a new flag under the same colonial masters. Hard times, depression, and alienation befalls on everybody. Democracy is not perfect, it is not pure, but it bounces back. You had two options. Settle your problems in a free, Democratic way; or settle it in a violent, reactionary way-- letting your people eat up your lies; the people put their wholehearted faith in a few men, and ta-da! All their problems would be solved. Unfortunately, whether it had worked for you or not, in our world it did not and will never. Our faith in the Japanese Emperor was repaid in mass starvation. Collaborationists who had thought Japanese 'assistance' was the cure to centuries of imperialism were surprised to know that the will of a single man could not solve the piling problems of the Asian people. Nevertheless, there is another difference we hold. Respect. Respect for other nations and the opinions of the masses, in their own pursuits for sovereignty. Respect dictated by Juche, as Kim Il-Sung fathered it so. Juche. The People are the masters of the nation now. That no country should ever infringe upon the unalienable right to choose one's own form of government. As to the gift, I shall take it in good health to accept, for this very reason and because when all is said and done, you have the capacity to fight Capitalism. Because, despite all of the mistakes we believe you have made, we respect the will of the people. But mark my words-- should you impose that will to oppress and to extinguish the well-being of any other nation, or of your own nation's people further; we will not hesitate to meet you on the battlefield. Because the only way our way of life, the way of respect, can be protected; is to ensure that we never respect those who use these institutions to destroy our ways. We will not hesitate at all, to liberate the people. And, having that said, I would like to offer my own platitudes. On behalf of the Asian Diplomat's Cadre, and the State Development and Planning Commission, I would like to send my contingent of economic advisors, 40 select graduates of the University of Peking and the University of the Philippines, to study the ways of the Reich in your capital. Please accept them as official emissaries from the Pan-Asiatic States. They also seek to advise your administration too, with your permission, on matters that govern the people and the economy. At the end of the day, we value peace. Perhaps there is some form of peace we may foster through this mission." I did not think you would understan what we went trough, but what did i expect from a terran you hated us when we gave you everything and tried to revolt and when you failed you though we would forget and ignore you.I would have loved to see their faces when we eradicated their home planets and killed billions.Call yourselfs the champions of the people and claim you only care about them but when the situation gets desperate you will gladly sacrifice them to survive and save your own head, it is only natural after all for a terran to lie and betray for his own benefit. The Archon will accept your graduets and give them honorary desolatoran status for the duration of their stay,he hopes they are not completely unaware of where you are sending them because i think their families will be againts them going here if they know about us.Also if they disrespect the Archon,the reich or meddle in afairs not for them they shall be treated like any other terran in the reich.I also forgot to mention do not try to reverse engineer the tehnology of the Scorpion company or you shall face our wrath. "To the communist nation in the far east. What your opinion about our nation, Nawawi?" Nawawi wrote: "To the communist nation in the far east. What your opinion about our nation, Nawawi?" "Emir, Sir, I think my adoration for your people's historic strife is a sentiment shared by my own people as well. Nawawi has undergone several changes under several colonial masters, but as the nation stands united today, I have almost absolute faith that the compassion harbored by your nation for independence and freedom is one that outlasts the rusting of French and Roman shackles. I personally confide in the comfort of knowing we have encountered a fellow endower of nativism. Good tidings to you, then, and your kin; for accomplishing such an astounding feat-- through wave after wave of liberation." On behalf of St Thomas's Cloisters, the second ranking of the five Cloisters of Court, as we currently do not have much information on the subject, I wish to enquire as to how the courts of Pan-Asia run, and if possible, how they compare to the court system of Great Nortend? A response from the relevant department would be appreciated. Information on our court system is attached herewith, to aid in any comparison. I beg to remain, &. &. You may wish to see my miscellaneous facts factbook or the court factbook if you want to give a thorough answer. Last edited by Great Nortend on Fri Jan 18, 2019 6:41 am, edited 1 time in total. Oh my god, you're right. I hadn't really fleshed out my judiciary system. Anyway, I had to put this together, which is why my answer is super delayed. This is also now in my Overview Factbook. I hope this satisfies you as much as it satisfies me. In the administration of adjudication, the people's courts adopt the system whereby a case should be finally decided after two trials. This means, first, a judgment or orders of a first instance must come from a local people's court, and a part may bring an appeal only once to the people's court at the next higher level. The people's procuratorate may present a protest to the people's court at the next higher level. Secondly, judgment or orders of the first instance of the local people's courts at various levels become legally effective if, within the prescribed period for appeal, no party makes an appeal. Thirdly, judgments and orders of the court of the second instance shall be seen as final decisions of the case. However, any judgments and orders rendered by the Supreme People's Courts as the court of the first instance shall become immediately legally effective. The people's courts to exercise state judicial power independently, free from interference from any organizations or individuals. The word "court" is of pivotal importance and, according to the authoritative explanation, means that the individual judges do not have the judicial power but the courts where the judges perform their duties do. The collegial panels are the trial units not the individual judges and the judgments by the collegial panels are made in the name of the courts. Therefore, the independence power of adjudication is vested in courts and not in judges. Based on this explanation, presidents and division chiefs may have a legitimate right to review and suggest changes in draft judgments prepared by collegial panels. This practice constitutes an internal interference with the independent adjudication of collegial panels and, strictly speaking, has no direct legal grounds except for the judicial committees. If a case is considered complicated or important, the final decision may be concluded by the judicial committee of a court rather than the designated collegial panel. This mechanism is said to be designated to safeguard the correct and impartial exercise of judicial powers, but in practice it may also be used as a device by some committee members to interfere improperly with the collegial panel's function and to provide favors to one side of a litigation. This also means that the Pan-Asiatic States' judiciary system functions as an independent estate within the state itself. Neither the Head of Government, the Secretary-General, nor the Head of State may intervene with cases adjudicated by the People's Court system in any way howsoever. The Supreme People's Court is the highest judicial organ of the State. The president of the Supreme People's Court is elected by the Congress of Soviets and its standing committee. His term of office is five years and he may serve for no more than two consecutive terms. The Congress of Soviets standing committee appoints or dismisses vice-presidents, head and associate heads of divisions, and judges. Protested cases filed by the Supreme People's Procuratorate. The Supreme People's Court supervises the work of the local people's courts at various levels as well as the special courts. "The Supreme People's court give interpretation on questions concerning specific application of laws and decrees in judicial proceedings." In reality, the practice of interpreting laws and decrees by the Supreme People's Court has developed in recent years to an extent that is called "judicial legislation". This was not previously defined in the Constitutional Law. However, the legislation does require guidance in order to fill gaps and to solve conflicts and some vagueness among the laws so that effective enforcement can be carried out by the judicial branch. The Higher People's Courts are courts of provinces, autonomous regions and municipalities directly under the Central Government. The internal structure is almost the same as that of the Supreme People's Court according to the definition of the organic Law. A higher people's court deals with cases of the first instance assigned by laws and decrees, cases of the first instance transferred from people's courts at the next lower level, cases of appeals and of protests lodged against judgments and orders of people's courts at the next lower level, and cases of protests lodged by people's procuratorates. They are the courts established in capitals or prefectures in the provincial level. The scope of jurisdiction by an intermediate people's court covers cases of first instance assigned by laws and decrees, cases of first instance transferred from the basic people's courts, and appealed and protested cases from the lower court. The basic courts, as the lowest level, are normally located at the county, municipal districts and autonomous counties. A basic people's court may set up a number of people's tribunal according to the conditions of the locality, population and cases involved. A people's tribunal is a component of the basic people's court, and its judgments and orders are considered as judgments and orders of the basic people's court with the same legal effects. In practice, a tribunal of this nature is often set up in big town or townships where there is a concentrated population. As defined in the Organic Law, the basic people's court adjudicates all criminal and civil cases of the first instance except where the law provides otherwise. Besides trying cases, a basic people's court is also responsible for settling civil disputes, handling minor criminal cases that do not require formal handling, and directing the work of the people's mediation committees. The special courts include military courts, railway courts and maritime courts. The military court that is established within the Pan-Asiatic States Armed Forces is in charge of hearing criminal cases involving servicemen. This is a relatively closed system. The railway and transport court deals with criminal cases and economic disputes relating to railways and transportation. Five maritime courts have been established by the Supreme People's Court at the port cities of Neo-Manila, Shanghai, Qingdao, Kota Kinabalu and Neo-Singapore. These courts have jurisdiction over maritime cases and maritime trade cases of the first instance, including any other disputes of this category taking place between Chinese and foreign citizens, organizations, and enterprises. Nevertheless, they have no jurisdiction over criminal cases and other civil cases belonging to the ordinary courts. The higher people's court in the locality where a maritime court is located shall have jurisdiction over appeals against the judgment and orders of the maritime court. Last edited by Pan-Asiatic States on Sat Jan 26, 2019 8:21 pm, edited 1 time in total. We wish to enquire as to the status of customary law in the Pan-Asiatic legal system. Our own legal system recognizes customary law as binding in matters of private law, with some exceptions as listed in the Constitution or federal legislation. Is customary law in your country recognized as valid in all matters, some matters, or none at all? Last edited by Bruke on Sat Jan 26, 2019 8:21 pm, edited 3 times in total. Bruke wrote: We wish to enquire as to the status of customary law in the Pan-Asiatic legal system. "Customary law is carried out in all matters with no exception. Law applies to the adjudicated insofar as it is not repealed. Laws being adjudicated may not be repealed for that case ex post facto." "Greetings comrade! We were just wondering what your thoughts were on the Yuhannist Party?" OOC: The Yuhannist Party is a WW2 fascist party in Samporna created by the Hero of Borneo and Beheader of Sultan Mohammed Samporna III, General Yuhanna bin Hafiz. 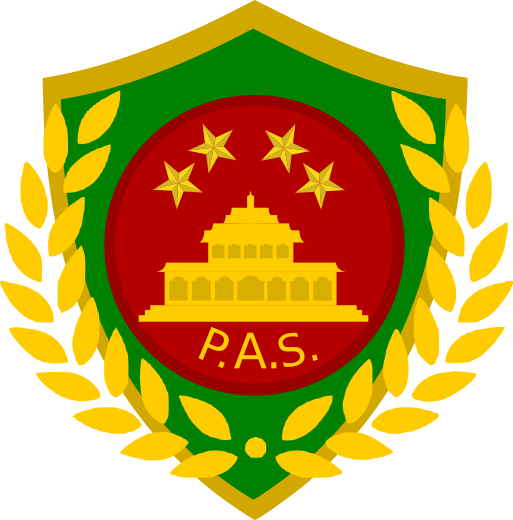 It is currently a party engaged in Sampornese politics, and led by Dollah bin Putih, with the ruling Sampornese National Party as both an occasional close ally and usually a fierce rival. Hand in hand, we march to meet tomorrow. NEWS:  Secretary-General of Pan-Asiatic States Comrade Abra conducts state visit in Samporna. | Anti-Jamahiriya Forces reported to be recruiting Sampornese expats in Gulf States. | Samporna considering economic partnership with Pan-Asiatic States.| Terrorist Group Sampornese Royal Army dispersed and hunted down by Sampornese People's Army. A 18 civilization, according to this index. Gaddafist democracy is the only true democracy. This nation represents my political views. "Sir, which one of our parties would you vote for? Also what do you think about out colonies? (See our map. We are located around Poland and have some colonies.)" "As He died to make men holy, let us die 'cause we want to!" I have joined the light theme war against the dark theme. Death is a preferable alternative to communism, death is a preferable alternative to democracy. Death is a preferable alternative to fascism. I just wanna die. Christian Atheists are Atheists who behave like Christians... I guess that makes me an Atheist Christian? I created a leader template with the stolen ideas of SC and Zitravgrad. Samporna wrote: "Greetings comrade! We were just wondering what your thoughts were on the Yuhannist Party?" "Fascism is not the proper way for the Austronesian islands. It makes us no better than the Japanese, or the Americans. That does not mean I don't advocate Nationalism, but as Uncle Ho advises us to do-- we should use it as an antithesis and an antithesis alone against the treacherous foreign bourgeois. We do not impose our will. We take what is ours and share it for the common good. And we stay there. Protect it where protection is due-- but NEVER to impose. Whatever political strife yields, it is the business of none but that of the people of that state. I shall comment nothing of the bearings your Party has laid its foundations on, but I will leave you with this: know that for all your actions, you will be judged. To kill a man remains murder. Conscience cannot be dictated by irredentism. It stains, no matter what." Deltanium wrote: "Sir, which one of our parties would you vote for? Also what do you think about out colonies? (See our map. We are located around Poland and have some colonies.)" "I honestly have faith in none of your political systems, if we're to abide by Leninist doctrine. Labor parties will compromise or are put into the ground by the 'majority'. Deltian politics is First World politics, and they do not represent the will of the proletariat. If a nation of kings borne of robbers were to vote between Socialism and Capitalism, would their politics represent the politics of the world? Of course, so long as we remain free in our autonomous pursuits, we care little. Nonetheless, tread lightly." 2. What are Pan-Asiatic State's views on Anarcho-Communism? 3. Is your attempt to create a 'Srivijian Asian' not contrary to natural order of races that exist? By attempting to create a single race, are you not undermining the spirit of tolerance and co-existence? Is this not an attempt in 'negative eugenics'? Justify. 4. Can couples who are not "matched" by the Statistical Union have a "live in relationship"? 5. What are your views on Her Majesty's Government? Last edited by Mizialand on Thu Jan 31, 2019 6:20 am, edited 1 time in total. 1. A strong Marxist democracy dictated by representatives of the lowest-earning classes of society trumps all governments. 2. Contrary to Marx, however, the Communist revolution works and has worked only in the Third World because countries of with majority-bourgeois are immune to revolution and their material needs do not represent the working-class; whereas Asian nations are converse. 3. Western society makes active efforts at historical and cultural revisionism through Globalism, and only a united Asian frontier with free trade among its culturally-mutual states but not with the West can protect the supranational ideals of Asia. 4. All efforts to meet the needs of the working-class must be made, and their support is the heart of the revolution; disconnection with them means the failure and demise of a revolutionary society. Neo-Maoism deliniates from 'Classical Maoism' insofar as its economic models are closer to Leninist Market models compared to Maoist Chinese society. It is simply an 'update' to Maoism, having learned from some of the failures of the past. Basically, Asia now operates under the idea that the Federation must outproduce the competitive market, or in other words, Capitalism between nations (Dengism/Leninism), but the market remains planned between State-Companies inside the Federation. Feel free to ask further questions on Neo-Maoism. Discourse is good." Mizialand wrote: 2. What are Pan-Asiatic State's views on Anarcho-Communism? "An odd failure of reactionary society. Anarcho-Communism was a Thermidorian Reaction to the Soviet regime, and even to the Spanish 'Socialist' regime. It is inherently contradictory because Anarcho-Communism implies a general structure of society, which cannot exist without bureaucracy; the very thing Anarchists revolt against. Plus, disambiguated states are too utopian to exist without a central government, at least during the revolutionary phase. Under war by bourgeois society, Anarchist society would surely fail to organize itself as effectively as existing Socialist models. Simply put, it's the same way Democrats view the Ancient Greek Republican Society-- useful, revolutionary, but frankly, outdated." Mizialand wrote: 3. Is your attempt to create a 'Srivijian Asian' not contrary to natural order of races that exist? By attempting to create a single race, are you not undermining the spirit of tolerance and co-existence? Is this not an attempt in 'negative eugenics'? Justify. "Not per se. It is in fact the converse. We believe coexistence can exist, but not last. The Soviet model is constantly under threat by uprising because many of its member-states feel that the 'Soviet Empire' only continues the Russian occupation of times old. We don't justify genocide, all humans have the equal right to exist. But by creating communities with physical resemblance, we promote a more long-term society primed to function as a collective. We build on the foundation of every society-- familiarity. You are more likely to cooperate with your countrymen and family, rather than, say foreigners or outsiders to the country. Coupled with our autarkic ecnomy and closed borders, we aim to ensure that the revolutionary socialist society stays immune to the Neo-Imperialism of the West for ages to come." Mizialand wrote: 4. Can couples who are not "matched" by the Statistical Union have a "live in relationship"? "Couples are already guaranteed living spaces upon passing registration, one of the incentives of the Igarashi System. The Statistical Union is more of a formality, so long as they raise the child as a couple, as father and mother, and do not engage in unregistered non-cloned physical birthing, they may do what they wish." Mizialand wrote: 5. What are your views on Her Majesty's Government? "As I've stated, bourgeois societies stay bourgeois and do not represent the proletariat. We have no reason to meddle with the affairs of your nation when our business is strengthening our own. But we do not approve of the ways of your democracy. We hold our belief that your integrated monarchy continuously pursues a semi-feudal culture, wherein a petty-bourgeois model deludes the government from the actual needs of the working-class. In English, the proletariat need not business-- they need work and guarantees of steady pay. Liberalism is a distraction, but, still, a boon compared to an Authoritarian Capitalist dictatorship." Because, at the end of the day, you won't have much of a population. And thanks for greeting me. Really appreciate it. OOC-How did you format the Spoiler'd part of your sig? Bijju wrote: OOC-How did you format the Spoiler'd part of your sig?